The starters have all worked a decent portion into the game (Correia 6IP, Maholm 6.2 IP, Ohlendorf 6IP), they’ve given up 20 hits in three games, six earned runs and struck out nine while yielding just one home run. Now, sure, the expected implosion might come for the starters, but through three games, they have pitched above and beyond what probably most people expected. The rotation could be in trouble if the defense continues to play like they did this weekend. As I was watching the games this weekend, I was thinking about the rotation, and the makeup of the team. Paul Maholm and Kevin Correia both pitched great in their starts. Ross Ohlendorf wasn’t as effective, and you could argue he got a bit lucky at times, which prevented it from being a disaster. However, all things evened out, as the Pirates suffered some bad fortunes in Maholm’s start, and made up for that with good fortunes in Ohlendorf’s start. It’s way too early to count on this performance to continue from those three starters, but if it does, this is a team that could surprise people. The offense looks good, and outside of the bad game on Saturday, the bullpen is very solid with a lead. All they need is a group of starters who can give them six strong innings more times than not, and the Pirates could be a big surprise. As Colin mentions, the expected implosion could come from the starters, and it’s far too early to feel at ease about the season. One reason I don’t feel at ease isn’t because of the starters. It’s because of the defense behind the starters. The defense this weekend was very bad. Kevin Correia pitched an excellent game, with the only runs coming as a result of bad defense. The blown game on Saturday was partially due to a big error from Lyle Overbay. 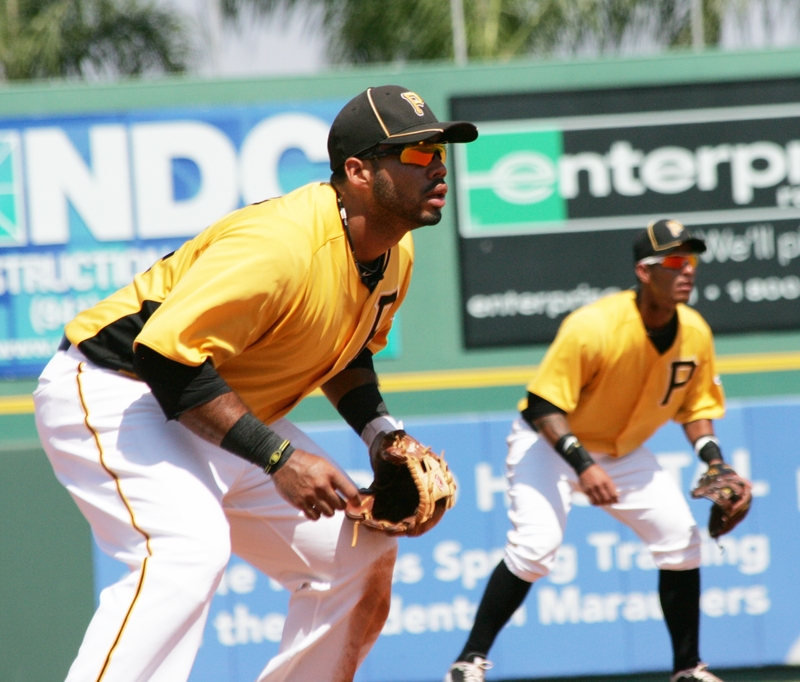 Ronny Cedeno almost threw the game away on Sunday, missing an easy double play throw after the Pirates stole a late innings lead. In most cases, the Pirates managed to escape with the win. Correia pitched great on Friday, making up for the poor defense. Joel Hanrahan got a grounder right back to Cedeno on Sunday, giving him a second chance at that game inning double play. However, Saturday’s error extended the inning, and that combined with poor pitching from Evan Meek and Chris Resop turned what would have been a two run inning in to a five run frame. The Pirates can’t continue to win with such bad defense. They’re not going to get that effort from Correia and Maholm every time. Ohlendorf won’t be so lucky if he continues to average about two base runners per inning. If the defense continues this sloppy play, there would be no way the team would be able to improve. The pitching has been good so far, but it’s only been three games. We don’t need more than that to realize that this pitching staff isn’t good enough to deal with a handicap like the one the defense provided this weekend. It was good to see the Pirates overcoming those problems and taking two of three from the Cubs, but I wouldn’t bank on that happening all season. Not that I am defending Cedeno’s defense thus far….but the so called “easy double play” missed on Sunday was far from easy. He had to charge the ball and make a throw across and behind his body. In my mind, it was an ill-advised throw and he should have taken the easy out at first instead of trying to make a spectacular play. It wasn’t all bad. Walker made a nifty pivot on the game-ending DP. I didn’t see Pedro’s play on a grounder towards short, but hear it was above average. Overbay won’t make a lot of misques. Cedeno, well …. but he did make the play immediately after his screw-up. Missed Ohlendoer’s 1st 3 innings, but he got hit hard shortly after I started watching. And I’ll be like everyone but Clint Hurdle in wondering why he went back out to pitch the 6th. Crotta may never pitch an inning as well as his first time out, but he looked awesome. What impressed me was the hitting vs. 3 pretty good pitchers. A couple of doubles and a pinch runner for JJ and maybe this game isn’t close. Is anybody talking about Hurdle coming out of the dugout? There was no Russell snooze fest going on in the dugout. It’s a good time to catch the Cards. Keep Albeert in the park and it might be an interesting series.